This is the latest in a long-running, very occasional series of posts about special effects but this is the first time (I can’t promise it will be the last) where my starting point is a trick I can’t explain. Of course, I know that the shot (see above) from Little Lord Fauntleroy, in which Mary Pickford, playing two roles, appears to kiss herself, was created using a double exposure, but I don’t know exactly how they got it to look so seamless. I would be grateful for any inside information, and interested in any speculative theories, about how this magnificent special effect was achieved. Much of this post was derived from out-takes of research for a chapter on special/visual effects in the silent era, for a forthcoming volume of the Behind the Silver Screen series from Rutgers University Press, which should be available some time next year. Double exposures had made possible many novel trick effects in the early years of cinema (and had their true origins in the vogue for spirit photography in the nineteenth century[i]), but found a new function allowing actors to play dual roles. In Edison’s 1912 version of The Corsican Brothers, based on the Alexandre Dumas story, Frank Lessey was able to play both twins thanks to a technique whereby each half of the frame would be masked for separate exposures, resulting in a composite final image with the two halves, shot separately, side by side in the same frame. This also required carefully co-ordinated action in the two takes that was “so perfectly simulated as to make a complete illusion”;[ii] the machinery makes the illusion possible, and the timing of the actor’s performance(s) clinches it for the audience. I think this film is now lost, or at least I haven’t seen it, but this review (click for a larger view) gives you a good idea of the response to it. I have seen the later version of the film (1941), starring Douglas Fairbanks Jr., which updates the techniques, using doubles to assist with the timing of the dual performances. This article from International Projectionist magazine explains in a little more detail. 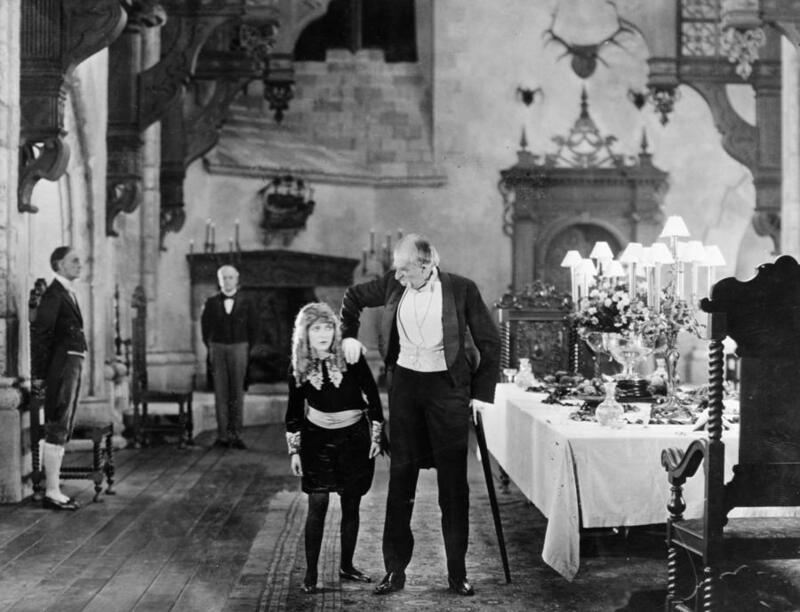 The techniques are not radically different from those used in Little Lord Fauntleroy, but the refinements have been around the creation of greater contact between the star’s two separate performances. The justification for casting Pickford in both roles, then, complicating the shooting of even simple dialogue scenes that could have been far more easily completed with two actors, is bound up with the commercial logic of that burgeoning star system, but also with the spectacular appeal of a technologically sophisticated illusion, one which showed off the studio’s in-house technical prowess. By the time Stella Maris was released, Pickford was the most famous actress in the world, so the promise of two of her must have made for an enticing marketing opportunity. 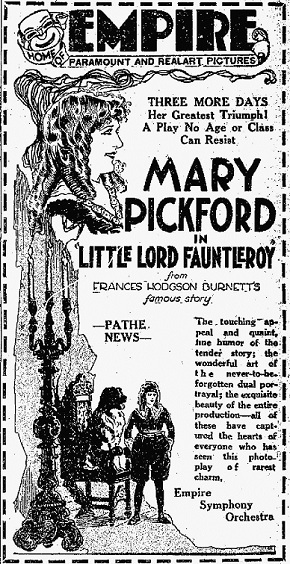 Claus Tiber has suggested that Pickford’s star persona was already a “dual role,” split between the bold businesswoman offscreen, and the onscreen “Little Mary,” figure, both of them constructed by Frances Marion, who wrote seventeen of Pickford’s screenplays, and ghostwrote her widely syndicated “Daily Talks” newspaper column to communicate with fans of “America’s Sweetheart.”[vi] By the time Stella Maris was released, Pickford was the most famous actress in the world, so the promise of two of her must have made for a very enticing marketing opportunity. When the film opened, 15 September 1921 at the Apollo Theatre, New York, Pickford was present to explain to the audience “very simply and in non-technical terms, how she had been enabled to play the dual role of mother and son … and also wherein Mary, as ‘Dearest’, kisses herself as ‘Little Lord Fauntleroy’.”[x] This kiss is a small moment (a son wakes his sleeping mother with a kiss), transformed by an impressive photographic trick into a noteworthy set-piece. Cedric (the little boy played by Pickford) sneaks up on his mother (also Pickford) sleeping in an armchair, and moves his lips towards hers. Cedric pauses, moving his face slowly towards his mother’s, and the camera lingers to allow the audience to anticipate and then enjoy the trick: the mechanisms of storytelling flex to accentuate a spectacular attraction. This is a small moment, slowed down and enlarged to allow the audience to anticipate and then enjoy an impressive photographic trick, teasing them with contact between elements; the mechanisms of storytelling flex to accentuate a spectacular attraction. We know that it was achieved using a masking process to enable the recording of the two performances, but how precisely they managed to bring the two elements into apparent contact without giving the game away is not clear. It’s probably just a matter of very careful positioning of “Cedric” and the mask around “Mother’s” face. The difficulty of the shot, and the prestige and spectacular impact that accompany its achievement, outweigh the narrative importance of a simple kiss. This is how special effects nestled into the narrational customs of American cinema, as talking points, as moments of magnified sensation. They could be mentioned as highpoints in reviews, and they could articulate the way cinema blended the spectacle of (world-famous) human faces with the containing spectacle of its machinery at work. Seeing a boy kiss his mother is an affecting piece of character detail, regardless of any special effects required to make it happen, but knowing it is Pickford mechanically duplicated enhances the moment, makes sense of why it is staged the way it is (slowly and deliberately), and uses the power of stardom to bond the film text with its intelligent address to an informed audience. As said R.W. Baremore of trick photography, “I’ve never met anyone whose interest in pictures was diminished through seeing those things actually done…”. [xi] Being in on the trick is essential to its full appreciation: even if you don’t know exactly how it was done, knowing that something was done is crucial. Marshall Neilan later said that they had retaken the shot where Stella leaves the room, followed by Unity (the camera pans to follow her): “They told us it was impossible to have her follow herself through a doorway, so we did it.”[xii] The difficulty of the shot, and the prestige and spectacular impact that accompany its achievement, outweigh the narrative importance of having the two actors leave the room in the same shot. They could easily have been shot separately. Later in the film, Cecil passes behind his mother, then they both leave the room/frame: it’s an escalation of the complexity applied to the double-exposure technique. The image of the double is a spectacular affordance of the medium, something which cannot be achieved onstage, for instance, and which offers an attractive visual conundrum by being impossible outside the conventions and capabilities of cinema. We know that there is only one Mary Pickford, because the promotional engines and marketing campaigns for stars routinely remind us of their unique qualities, their singular talents. Therefore, we are invited to read a scene with two Mary Pickfords as a technical achievement, since it graphically overcomes the most basic fact of her stardom, namely that there is only one of her in real life. But those viewers with some familiarity with these kinds of photographic tricks may be aware that the rules dictate that duplicated actors have to stay in separate zones of the frame, segregated by the giveaway line that marks the join between separate compositions and distinct performances. And dual roles would have been very familiar by this point. There were dual roles for Marc Macdermott in both Catspaw (1916) and The Price of Fame (1916), Marguerite Clark, playing both Little Eva St. Clair and Topsy in a 1918 adaptation of Uncle Tom’s Cabin, William S. Hart in Three Word Brand (1921) and Roy Stewart in Heart of the North (1921). In Lady of the Night (1925), Norma Shearer played twins separated at birth, but when the two were called upon to embrace in the same shot, Joan Crawford (in her debut screen appearance) was used as a double. Buster Keaton’s The Playhouse (1921) takes the trick much further in its prologue, in which Buster is star of the theatrical stage: Keaton plays every band member, and every member of the audience, transforming the theatre into an entertainment circuit of the self. But the simple act of the kiss that crosses the line, that teases the viewer with the illusion of physical, affectionate contact between composited elements, is a beautiful little way to show off a sophisticated application of the technique. Special effects, then, do not work purely on the basis of what we see, otherwise, we’d see only a brief, everyday kiss, but rather on what we know about what we see. [i] For a discussion of early trick effects’ debt to spirit photography, see Michael Chanan, “The Treats of Trickery,” in Cinema: The Beginnings and the Future, ed. Christopher Williams (London: University of Westminster Press, 1996), 117-122. [ii] “The Corsican Brothers,” The Moving Picture World, January 20 1912, 192. [iii] E.E. Bennett, “Seeing Double,” Pictures and the PIcturegoer, March 1925, 40. [iv] Barry Salt, Film Style and Technology: History and Analysis (London: Starword, 1983). [v] Carl Gregory, “Trick Photography Summarized,” American Cinematographer, June 1926, 21. [vi] Claus Tieber, “Mary Pickford: As Scripted by Frances Marion,” in Researching Women in Silent Cinema: New Findings and Perspectives, ed. Monica Dall’Asta, Victoria Duckett and Lucia Tralli (University of Bologna, 2013), 220-230. [viii] “Press Praises ‘Fauntleroy’,” Exhibitors Trade Review, October 1 1921, 1243. [ix]J. S. S., “’Little Lord Fauntleroy’ Triumph,” Exhibitors Herald, October 1, 1921, 54. [x] Ibid. It is actually the other way around in the film: Fauntleroy kisses his mother while she sleeps. [xi] R.W. Baremore, “Tales Told Out of School,” Picture-Play, February 1919, 177-182. [xii] Marshall Neilan quoted in Malcolm H. Oettinger, “The George M. Cohan of the Movies,” Picture-Play Magazine, October 1923, 103. This entry was posted in Early Cinema, How Special Effects Work, Special Effects and tagged double exposure, Mary Pickford, silent film, Special Effects by Dan North. Bookmark the permalink. An interesting conundrum. How was it done? I don’t know it’s certainly not just a double exposure. I would speculate that it might very well be a very early use of a matte. The Pickford on the left is stationary and it’s conceivable it’s a single frame (photograph/photogram) having been exposed in a first pass. The second pass then involves the projection of the second Pickford (the one on the right), but with a matte, that stops any of the second Pickford overlaying the first. If the first Pickford was a moving image the matte would have to be an animated matte (or travelling matte) which is far more difficult. A fortuitous effect is that sense in which the first Pickford appears to be casting a shadow on the second one. I say fortuitous in the sense that it may very well be that what we are seeing is the matte, an unintentional side effect of which is that it looks like a shadow, creating that sense in which the elements appear even more as if they were part of one image rather than recomposed from separate images. Thanks, Carl. I think you’re basically right. But sleeping PIckford is not quite stationary. There’s a little tremor at her lips that is perhaps not clearly visible in my Vined version of the moment (I took it from my computer screen with an iPhone camera so that it could play on a loop and be more closely inspected! I think they made a mask for the lens on the first exposure, shaped like the outline of sleeping Pickford, perhaps even positioning a stand-in on the set, but concealed by the mask, for Pickford 2 to kiss (thus casting the shadow that, as you say, really sells the illusion). We know that Pickford attended the premiere and explained how it was done, but no journals I’ve found have reported on it: they just vaguely mention “double exposures”. I’d love to know for sure, but as it stands, I’m just intrigued by the mystery and glad that there are still confounding illusions in the cinema from 90 years ago. Cheers Dan. Yes, I can see it, now that you’ve pointed out – she is moving isn’t she. But not so much that she’d require an animated mask that would have to follow her around. I normally use the term “matte” but that is, of course, just film jargon for the same thing. I have no idea why it’s otherwise called a matte. Calling it a mask is a lot more descriptive. So yes, it’s the same thing as you are discussing in the article, but one that takes the shape of an apparition within the frame. I discovered quite recently that all of the mattes used in 2001 were hand drawn, ie. not generated using any blue/green screen process (or precursors such as sodium vapour light).